The Colne Point race was a bit of an endurance test. The wind was very light and there was plenty of sun � ideal for spectating. Going out with the tide was only just OK and ALASTAIR & I were doing well by the time we got to Colne Point. Leaving CP I did fairly well for about � of an hour and had taken quite a good lead over slower boats. But then the wind totally died � we just sat there without moving (possibly backwards!) for 2 hours or more!! When the wind eventually filed in, it was from behind so lifting and benefiting ALASTAIR and a Sprint 15. We all three arrived back at Bradwell power station more or less together, and continued like this to the finish. I crossed the line at 5pm, 50 yds ahead of ALASTAIR � pretty close after 8hrs of racing! The Sprint 15 won the race by a mile on handicap. I came in 3rd and ALASTAIR 4th. 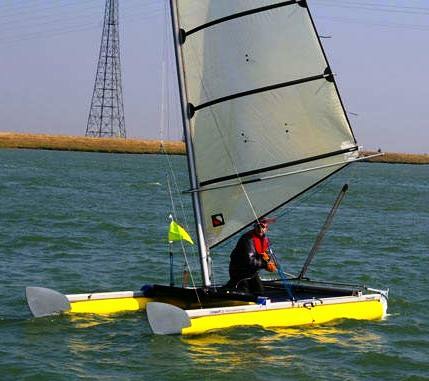 This is a clockwise race around Sheppey, starting at Sheerness, giving sea, river, and estuary sailing in tidal conditions. It has been going since 1959 and is the longest dinghy race in Europe. 124 boats took part this year with four fleets starting half an hour apart, catamarans last. 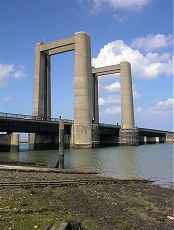 After the two long sea legs, the race turns around the eastern end of the island, and goes west up the Swale to the bridge, where boats come into the shallows and are walked under the bridge on their beam ends, with help from Club members. CLIFF ANTILL and ALASTAIR FORREST rigged on the beach east of the Club with a 10 minute run up to the start. They were surprised to see ALEX MONTGOMERY emerging from the Clubhouse shore. ALEX made a late call to take part and what a good decision it was - blue sky, 25 degrees and a solid ENE wind, Force 4, gusting 5. ALEX took a GPS with him showing he sailed 27 nautical miles with speed peaking at 15.2 knots. The beat down the north coast consisted of long legs on port, with short starboard legs out to sea. CLIFF and ALASTAIR chose to go along the shore to reduce the tide, while ALEX gained standing further out to sea until the final bluff marked the end of the long beat. Easing off to lead down the NE coast, the Catapults caught the first of the monohulls (a Mirror two men up, destined to go round in 10 hours) and rounded the end of the island, onto a broad reach and then a dead run. CLIFF swung further out, uncertain of grounding allowing ALASTAIR to gain. The Swale gave a broad starboard run, fast in flat water. ALEX gained by heeling the rig to windward helping to balance the boat with neutral helm. He didn�t lift the dagger boards as experience has told him that this didn�t pay much. ALASTAIR found speed over CLIFF and moved past and well away. He did raise the boards to clear weed. Negotiating the Kingsferry Bridge was tricky. The approach (to the shingle beach to to tip the boat and walk through) was a flat run in a brisk breeze and gave little space to turn into the shore, whilst avoiding a pontoon. One Tornado got it wrong, crashing into the pontoon, retiring on the spot with major damage. ALEX considered risking heeling the rig and sailing under the bridge, but it was just too close for comfort. CLIFF found running into the beach too risky so luffed and backed in under control. At the final turn, at Garrison Point, the Swale, Medway and Thames Estuary tides meet, with a deep back eddy. On the surface, these kicked up some standing waves, which pitched the boats around. ALEX was thankful he had tied his kit bag securely to the boat, as a few waves washed completely over him. From Garrison Point, the Club and line are visible, and the breeze was just enough north of east to fetch it on one final long port tack. ALEX had a course time of 3hrs 29 minutes, and on PY corrected time scored 22nd He beat no fewer than 10 Dart 18's over the water and a further 5 on handicap, and also dispatched a Topaz 16 and Dart 16 quite comfortably. As he said, it's nice to remind yourself and others every so often how well the boat goes. Using SCHRS, the Catapults came in at 16, 21, and 30, probably held back by now being classified as a trapeze boat. Put another way, the Catapults were the fastest way of going round the island single handed, beaten only by one of the Int. Canoes, a much harder way to travel. Overall it was not much longer than a 3 race regatta day but with a greater range of conditions. Next year, shooting the lifting bridge will be firmly barred! !